The Q (Typ 116) is the first in a new line of digital cameras from Leica, which the company describes in its specification as a ‘digital small picture compact camera’. Featuring a fixed 28mm f/1.7 lens and a full-frame, 24.2-million-pixel sensor, the Leica Q has a sensitivity range of ISO 100-50,000 and shutter speeds from 30-1/2000sec. However, at 1/2500sec an electronic shutter kicks in, which allows speeds of up to 1/16,000sec to be used. Images can be saved as JPEGs or Adobe DNG raw files, and there is the usual array of spot, centre and evaluative metering, as well as PASM shooting modes. Basically, there is everything that you would expect to find on a contemporary, high-end digital camera, including built-in Wi-Fi connectivity and full HD video capture. 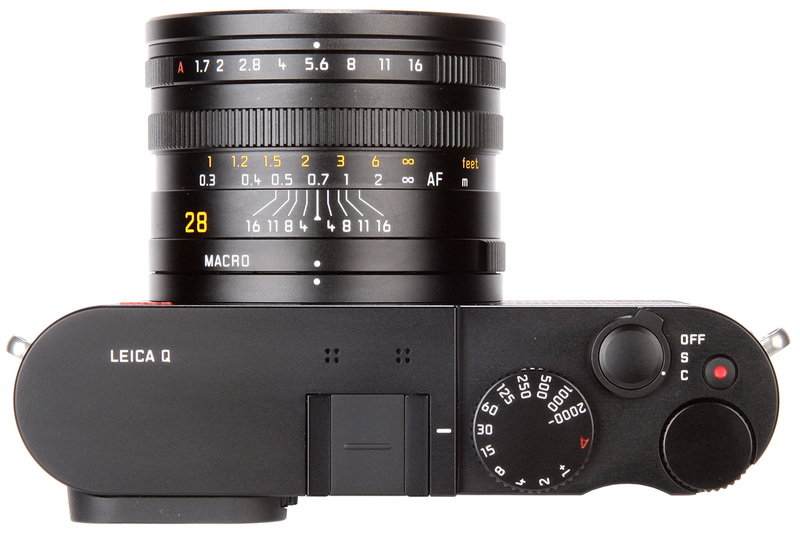 In many respects, the Leica Q is the only direct competitor to the Sony Cyber-shot DSC-RX1. However, the real story of the Leica Q is the way it breaks from some of the traditions many would expect of a Leica camera. For example, something that’s sure to raise an eyebrow among many Leica users is that the viewfinder is electronic, rather than the optical rangefinder system used in Leica’s M series of cameras. 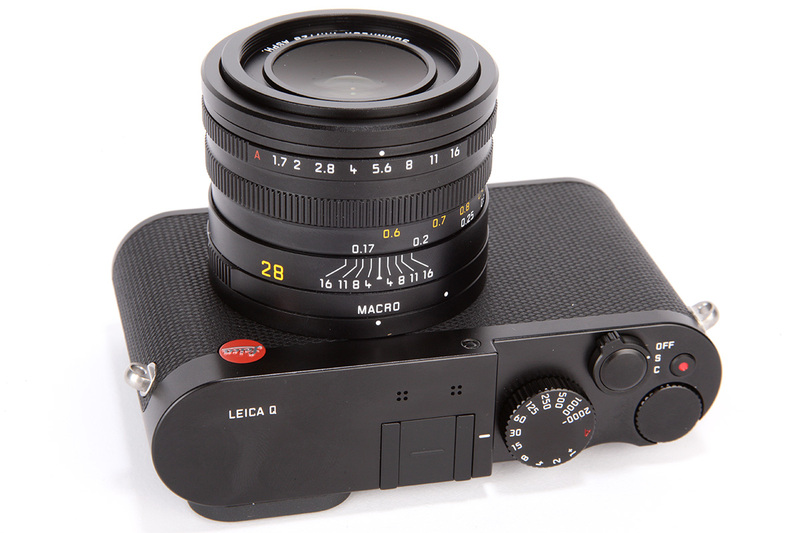 Speaking of the M series, the Leica Q’s body resembles a slightly stunted version of the Leica M. It has all the same key characteristics – curved sides, flat top-plate and bottom-plate, and a shutter-speed control dial on the top of the camera, while a 3in screen and a small selection of essential buttons sit on the rear. The camera has all the quality and rigidity we have come to expect from Leica, and existing users should feel right at home. Leica’s lenses are held in just as high regard as its cameras, and with the Q only offering a fixed lens it is vital that this lens perfectly matches the body. In this case the lens has a 28mm focal length and comprises 11 elements in nine groups, with three of the elements being aspherical. The aperture range is f/1.7-16, selected via a ring at the front of the lens barrel. The lens can be manually focused and Leica’s trademark lever is featured on the bottom of the focus ring, allowing you to focus quickly and smoothly, as it is shifted with the thumb or a fingertip of the left hand. This lever also features a small button that, when pressed, allows the lens to be slipped into AF setting. The clever mechanics of the lens don’t stop there, though. At the rear of the barrel, closest to the camera body, you’ll find a ring that allows the lens to be switched to macro mode. This pushes the optical unit forward slightly, which changes the minimum focus distance from 30cm to 17cm. As a photographer, I tend to spend a disproportionate amount of my time shooting in AF, as I’m sure many of us do. However, this was not the case with the Leica Q. I spent the majority of the time testing the camera in its manual-focus mode. The reason for this is as much to do with the electronic viewfinder as it is the lens. With a 3.68-million-dot electronic viewfinder, the Leica Q has the highest-resolution EVF of any consumer digital camera and it is quite extraordinary. I’m going to make a big statement here and say that the EVF is the best I have ever used. I know we may have said this before, but this really is a step forward. It’s so bright, crisp and clear, with an incredible amount of detail, that you forget you’re looking at a digital display. This detail is evident when manually focusing. A slight turn of the lens and a magnified view is displayed in the viewfinder, or rear screen, and it’s obvious when the lens reaches its bitingly sharp point of focus. Combined with the option to use focus peaking (which I didn’t really use for focusing other than to help check the depth of field), manual focusing with the Leica Q just seems like the default focusing mode, rather than auto. 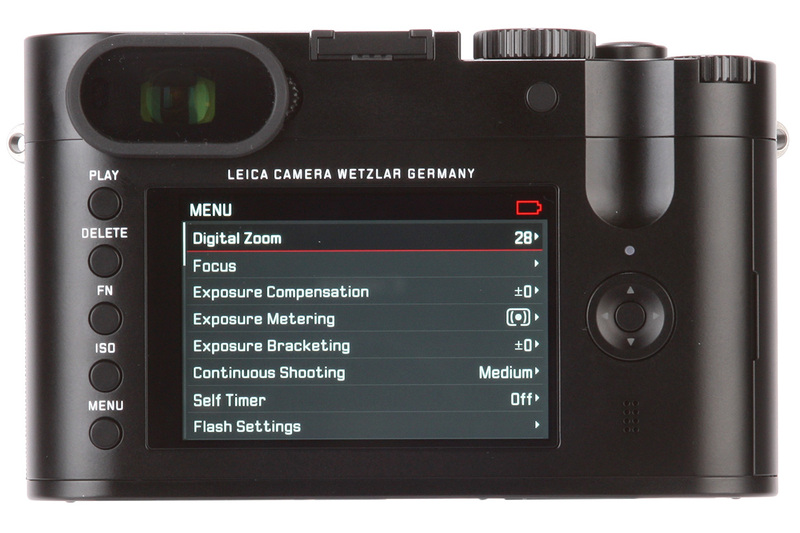 At the rear of the Leica Q is a 3in LCD screen with a resolution of 1.04 million dots. It is bright and clear, but the real key feature is its touchscreen. Like the EVF, the touchscreen is sure to cause some dissent among Leica ranks, but as someone who has used the camera, I can say that it added to my experience and pleasure in use. While I did spend the majority of my time manually focusing, the touchscreen was fantastic for selecting the focus point. With the screen activated, all you have to do is touch the area you wish to focus on and snap, and the lens locks in to focus. In fact, the autofocus works so quickly that often by the time you have removed your finger after tapping the screen, the camera has focused and you are ready to take your shot. After using the Leica Q for a couple of days, I have to say that I am hugely impressed. The camera produces the high-quality images you’d expect from a Leica, and the black & white mode is particularly impressive. Of course, the lens is also fantastic. It’s incredibly sharp and the f/1.7 aperture also combines well with the fast electronic shutter, meaning you can shoot wide open even in bright sunlight. I guess the real advantage of the Leica Q is the way all these individual elements work together. The EVF pairs well with the lens for manual focusing, while the touchscreen makes autofocusing away from the centre of the frame easy. These elements, that you wouldn’t usually associate with a Leica, actually add to the experience and all complement each other. The Leica Q is available now at £2,900. I’m already looking forward to heading out again with it and seeing exactly what it’s fully capable of. 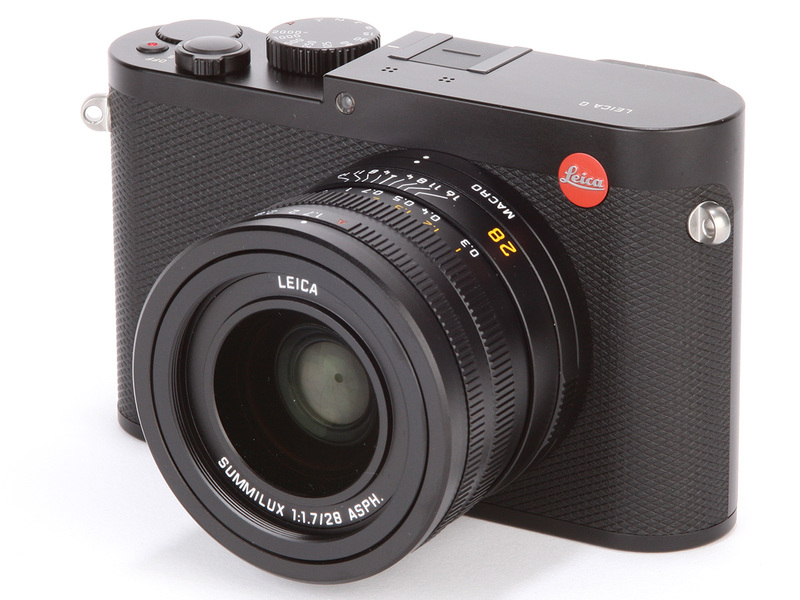 Look out for our full review of the Leica Q in the next few weeks.